Fruits Basket Yuki یا Kyo? So either it's Yuki or Kyo, tell us all! kyou is far away from yuki in different aspects! haha, im too mean and bias!! KYO! I love violent men! and they dont get more violent than him. also i love cats! i wanna hug him just so i can hug him in kitty mode! Kyo!!!! I don't have all the books yet but so far the one i like better is Kyo!!!! It's just like tokyo majin but what ever... (awkward silence) oh and whoever watched this and read the manga you you guys should watch tokyo majin really good!!!! 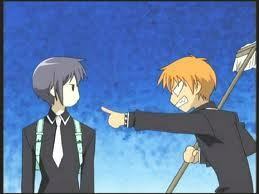 and there are no manga's for that series... (crying) alright anyways I vote KYO!!!!!!!!!!!!!! Kyo because he protect the ones he loves with great passion and he has a lot of the same interests that I have. He is kind and sweet and I think that it is really funny when he looses his temper over little things. ...That's like... asking me if I wanted to go left or right on a straight road! After finishing the manga... I really wasn't sure who I liked better! I guess... if I had to choose one it would be Kyo, because underneath his anger, he's really a nice guy who wants to be accepted. KYOOOO!!!!!!!!!!! my GOD hes so hawt....also, yuki kinda creeped me out at first, but hes kinda awesome in da manga. YUKI SHUD BE WITH MACHI AN TOHRU SHUD BE WITH KYON-KYON!!!!!!!!!! well, in ze manga kyo an tohru end up together anyway so YAAAAAY!!!!! KYORU! not that im gey,but kyo.he is real,even though a little...rash.still,he tries to show his emotions,and i like that.